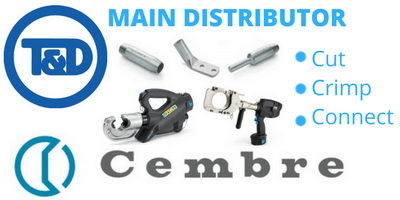 Cembre AA-M series of cable connector lugs are made from aluminium of a purity equal to or greater than 99.5% – designed to terminate aluminium conductors including low stranded compacted conductors to BS6360 (withdrawn) and replacement standard BS EN 60228:2005 (Specification for Conductors in Insulated Cables). Sectoral aluminium cable conductors require pre-rounding prior to introduction of the cable to the terminal lug – aluminium cable lugs are suitable for connecting LV and MV aluminium cables, 11kV-33kV, up to 630sqmm. The internal surface of the cable lug is protected against oxidation with the inclusion of a specific grease with an exceptionally high dropping point – the solid construction cable lugs are water-blocked without inspection holes and suitable for both indoor and outdoor applications on switchgear, transformer or pole-mounted installations up to 33kV. 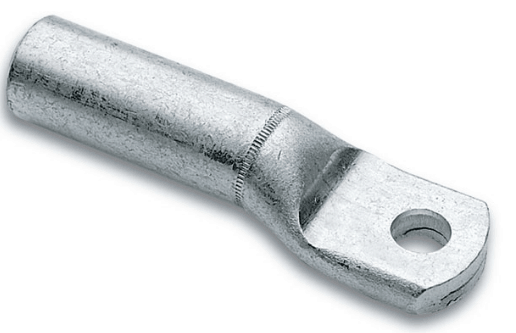 Cable lugs are suitable for terminating 1500V solar cables with aluminium conductors to class 2 based on EN 60228 and IEC 60228 – used to terminate solar cables for interconnecting power supply to solar arrays. 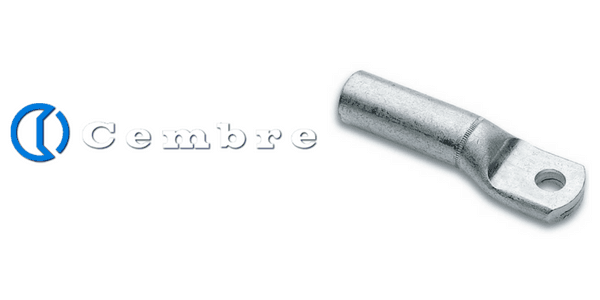 ➡ For information about crimping tools for aluminium cable lugs please see Cembre HT131-C.
lndent the aluminium connector in the sequence shown below (FIG.2). For a through connector indent the outer positions first, followed by the inner positions. For a cable lug indent the position near the conductor first, followed by the position near the palm. It’s important to follow the sequence shown in order to obtain the correct conductor fill coefficient essential for producing a stable electrical connection on aluminium conductors. ➡ See also copper cable lugs for 11kV-33kV medium and high voltage cable connections and terminations – aluminium splice connectors are used to joint LV-HV cables in heat shrink, cold shrink and push-on type high voltage cable joints.